Ethernet cable instead of Thermostat wire? I need to pull new wire from my furnace to my thermostat and was wondering if there would be any problems in using an Ethernet cable instead of standard thermostat wiring. The reason being is I have left over cat6 cable and figured the wire should suffice in place of spending cash on a 4-wire thermostat cable. fwiw: the run will be approximately 50'. Ethernet cable should work fine since thermostats use low voltage and low current. For simplicity, it's probably easier to use each pair as if it were a single wire. That makes is easier to remember what is what at each end and clearer to anyone looking at it years later. I wouldn't do it. The next poor sod (who may be you) trying to fix something (or perhaps changing the system!) is expecting to find properly colored #18 AWG wire. Instead they'll find #24 wire in all these weird (to them) colors. You're saving yourself some money now, and making someone else's life difficult down the line. And of course, if you or someone else later change to a system that requires the #18 wire, then it's got to be ripped out and re-run, which is another pain in the neck for someone. I advise against doing non-standard things that are going to cause someone extra work in the future! The big question is if your thermostat/furnace is line voltage or low voltage (24V usuaully). If it is line voltage, then no, this might be outright dangerous and a fire hazard (ethernet is not rated for this type of voltage). If it is low voltage, there is no reason why this wouldn't electrically work, at least in the short term. I would however worry about if the cat6 can stand up to the higher temperatures near your furnace, and whether the cable could itself be a fire hazard. Ethernet can be quite fragile compared to bell wire (for example); it is of higher gauge and the insulation is not as robust. The high-speed properties of ethernet (twisted pair, pair ratios, wire arrangement, etc.) is of no importance here so there is no real reason to use more than a single conductor. If anything this might just confuse the next person working on it. If it were my house, I would not use this. Thermostat wire is cheap, safe and proven. The savings by using leftover cable is easily exceeded if this setup fails (needs replacement), or worse yet, causes damage to your furnace, thermostat or house. Here is the real deal. National Electrical Code. CL1 and CL2 rated cable is the only approved method. Yes, almost every heating & cooling unit is electronically controlled, 24vac and extremely low current. Even the thermostats are battery powered and only signal heat/cool and fan. 5 conductors is the standard for heat/cool unless someone fingers the controller board around a bit. Keep in mind that thermostat could actually be switching the A/C condenser unit also. Those little contacters NEED full voltage and current to completely pull in and prevent contact failure. The 24V system in a HVAC typically has a fuse or breaker for either 3 amps or 5 amps. Sometimes it is a fuse on the control board and sometimes it is a breaker built into the transformer. Typically, the current is about 0.5 amp - 1.5 amp in the 24V system when the AC or heat are running. The 24V control board usually shows the expected current flow. At 1 amp in a 24V system with the thermostat 50 feet from the HVAC control board (100 feet total -- 50 feet of red or yellow plus 50 feet of white make the circuit ) there is a 1.5 volt drop through the resistance of 100 feet of 18 gauge wire. If you drop that wire down to 24 gauge, then there is 5.3 volt drop at 1 amp across the same distance. That's in a normally operating system. If the system has a problem and runs 3 amps it might not trip the breaker or fuse, so there would be no indication of a problem. At 3 amps in that same 24V system, there would be 16 volts dropped due to resistance in that 24 gauge wire, but less than 4 volts dropped due to resistance in 18 gauge wire. Remember that the only thing limiting current in this system is either a 3 or 5 amp fuse or breaker, so any system problem causing current just below those limits might go on indefinitely without any indication. You're taking a heck of a chance of a fire by using 24 gauge wire in this application. Don't do it. 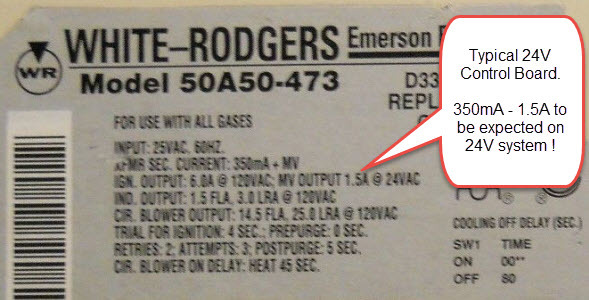 My 24 VAC transformer is rated at 40 VA. So that would translate to a rating of 1.67 Amps on the 24 VAC side. rates 24-gauge at 3.5 amps for chassis wiring and 0.577 amps for power transmission. So a short run of CAT-6 might be OK, but I'd tend to think of wall wiring as more in the power transmission category and go with 18 gauge. Household stats are 24v. 450ma max because the transformer can only output that much, so difference in stats won't matter. POE is upwards of 50 volts and each strand of cat5 is rated up to 60v and 630ma. That's at least 10% wiggle in amperage and obviously more on the voltage. The wire is capable. If it's plenum, then it's fire rating is also sufficient. But it should only be solid core (riser cable), not stranded. Not the answer you're looking for? Browse other questions tagged wiring hvac or ask your own question.